Years ago my family had a cocker spaniel named Samuel, and every time someone came over to the house, he would jump on our guest or try to sit in their lap. As you know, not everyone is a dog person, so it became increasingly clear to us that we needed to teach him to stay put when told to, among other essential commands. Today we have a mutt named Lola who sits when told, and it makes it so much easier to entertain in our home. 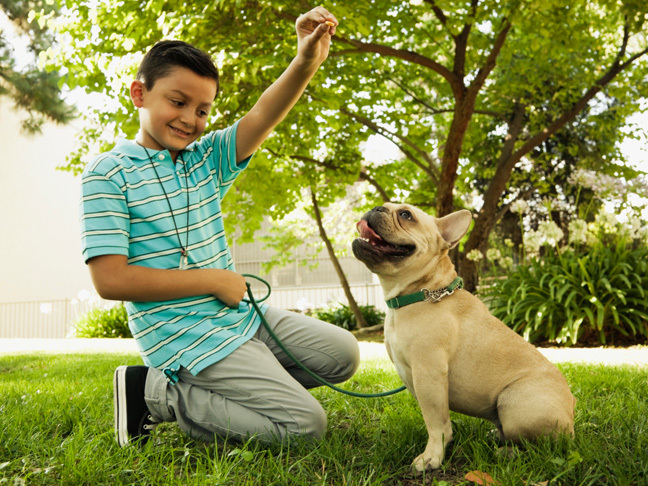 You don’t have to be an expert dog trainer or teach your dog dozens of commands to ensure you’re keeping your pet — and everyone else — safe and comfortable. Here are the top commands that every perro should know, no matter the breed, size, or temperament. This is perhaps the most important of all commands, says Katy Nelson, veterinary contributor to Pet360.com and host of The Pet Show with Dr. Katy. From keeping him calm during a party to ensuring he doesn’t run away if you accidentally drop the leash during a walk, “stay” is an essential command. This teaches dogs manners and ensures people can approach without having to worry that the dog will jump all over them. “If a dog is sitting, they are not doing other things, like jumping,” says Heidi Ganahl, founder and CEO of Camp Bow Wow, in Broomfield, Colorado. “It is also good to have a dog sit while you put their food bowl down on the floor, and put their leash on.” Before we give our dog, Lola, her Beneful Chopped Blends, we always ask her to sit first. Her favorite food is her reward. It’s important that your dog understand “drop it” (or “leave it”), because, as you know, dogs have curious noses. “If a dog gets something in his mouth, you should be able to ask the dog to let go of it,” says Ganahl. “This can be especially important if they pick up something that would be harmful if swallowed.” Our dog, Lola, is constantly putting my son’s jugetes in her mouth. In some cases, they look almost exactly like dog toys, so I can’t blame her. We strive to keep things put away, but inevitably something is left out, and it’s important she knows that when we tell her to drop something, we mean it. Ana Connery is an accomplished storyteller whose writing has appeared in a variety of magazines and websites, including Yahoo! Parenting, Parade, and the Huffington Post. Formerly the content director of Parenting, Babytalk, Pregnancy Planner, and Conceive magazines as well as parenting.com, she’s also held senior positions at some of the country’s most celebrated magazines, including Cooking Light, Latina, and Fitness. Ana frequently appears on "The Today Show," "Good Morning America," and CNN as a parenting expert. She has interviewed the country’s top pediatricians, psychologists, and educators, including U.S. Secretary of Education Arne Duncan and First Lady Michelle Obama, as well as celebrity moms including Jessica Alba and Bethenny Frankel. You can find her on Twitter (@apconnery) and Instagram (@apconnery).